A Disney classic with a twist, this divine diamond ring is inspired by the The Little Mermaid character Ursula, as part of the Enchanted Disney Fine Jewelry Villains collection. A luxurious lilac Amethyst crystal is is presented upon a black rhodium plated silver band, styled as twisting tenticles from the villain herself. Beautiful and bold black diamonds grace this wickedly wonderful accessory, totalling 1/4ct. An eerily and elegant design to capture the Disney magic. 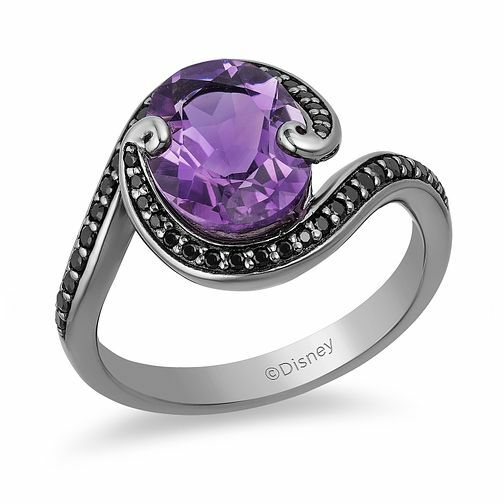 Enchanted Disney Villains Ursula Diamond Ring is rated 1.0 out of 5 by 1.